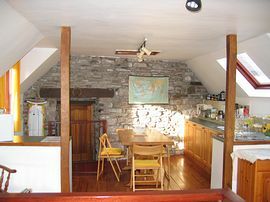 Pregge Mill is a spacious and beautifully restored Welsh cottage with hard wood double-glazing. 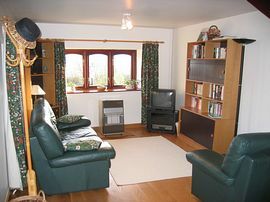 It is situated on the edge of Crickhowell overlooking the town. 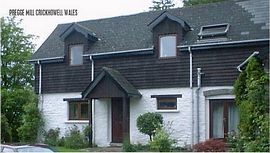 It affords superb views of the Brecon Beacons and is within easy travelling distance of the Black Mountains and the west Wales coast. The busy market town of Abergavenny is only ten minutes drive away and many other picturesque villages are close by. Pregge Mill is a no smoking establishment that is luxuriously appointed throughout with fitted carpets, oak flooring and comfortable furniture. 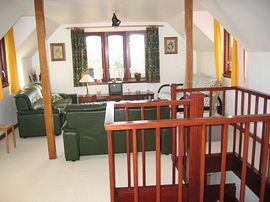 There is a ground floor double bedroom opening out onto a patio garden with deck chairs. The bathroom and shower are adjacent to the bedroom, with low level toilet and matching vanity unit with electric shower, and shaver point. Also on the ground floor is the living room with wall units, colour television, and video. This room leads via a feature spiral staircase to a very large 40ft lounge area with views on every side overlooking the whole town and surrounding mountains. One of the three double settees opens out in to a double divan. Tuner, CD, video, and TV units are also found in this room. The kitchen area comprises of an electric hob, sink/drainer, refrigerator, freezer, combination oven/grill microwave oven, plenty of storage and dining furniture. The whole area is centrally heated at no extra cost. Hot water for the shower and kitchen are also inclusive. 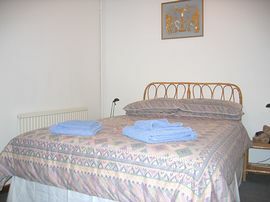 Linen, towels, and all cooking utensils including pots and pans, cutlery and an iron is provided. A food parcel and milk delivery can be arranged. Washing machine and tumble dryer are available (Welsh Tourist Board approved) at a small charge to cover costs. Please note that this accommodation is primarily for two people, but can easily accommodate four. We are sorry but we cannot accommodate any pets. Lounge View is overlooking Crickhowell. The pub at the bottom of the hill is called the White Hart. Pregge Mill is 500 metres up the hill on the right hand side. A week runs Saturday to Saturday. Departure Time: By 10.30 a.m.
We wanted to escape for a week of calm and we certainly found it here! Beautiful cottage in a beautiful place. Looking forward to coming back again soon. Frank Doyle Redhill. April 2005. Excellent accommodation in superb scenery; really took our minds off work. John Borrett. Leiston. May 21st 2005.